When first getting into aquariums often the first thing you learn about or hear about is ammonia in the aquarium. Understanding Ammonia is so vitally important for Aquarium hobbyists and especially shrimp farmers alike. Understanding ammonia and the science behind is often never done. Aquarium hobbyists more times than not simply don't “get it”. Ammonia is a compound that is a part of nitrogen cycle and is in the everyday cycle of life! The decaying process of all living things produce ammonia, so in turn this means the breakdown of dying leaves, dead fish, dead shrimp…etc in your aquarium produce ammonia. Often times depending on your local water source, or part of the country you are from, your tap water will often contain ammonia. Ammonia is toxic to fish and shrimp alike. Ammonia is a compound that is used by bacteria as food. Bacteria then in turn changes ammonia to other compounds such as nitrate and nitrite. In the aquarium, plants and or algae use these sources of nitrogen compounds to synthesize amino acids and chlorophyll and this is what helps plants grow and stay healthy. Then the process starts over again (Nitrogen Cycle). The Cycling Process of the Nitrogen cycle begins with ammonia. In the nitrogen cycle it has what is called nitrifying bacteria or sometimes referred to as BB (Beneficial Bacteria). BB is what breaks down the ammonia, so when starting the process of cycling an aquarium you need to add a source of ammonia (Via pure ammonia, allowing fish food to decay, using live fish…etc). Once the level of nitrifying bacteria has built up in the aquarium it will successfully be able to breakdown the ammonia into nitrogen compounds. This is important because as your shrimp and fish produce waste it will create ammonia, and we need ammonia to be broken down otherwise it will harm our fish and shrimp (we will visit the topic of Nitrogen Cycle in another article more in depth)! Shrimp exposed to a tank environment with levels of ammonia will be more likely to encounter bacterial infections, have poor growth rates, and harder time breeding. Ammonia gets into the gills, it affects the organs, and appetite. Low levels of ammonia 0.03 mg/1 (PPM) or less are not harmful to shrimp or fish, any level above is considered harmful and something that needs to be addressed in your tank. pH levels play a very large role in how harmful ammonia can be to you shrimp. Many shrimp farmers that keep the everyday Cherry Shrimp, Yellow Shrimp, or Blue Velvet Shrimp often keep their shrimps at pH levels that are Alkaline (Meaning above 7.0 on the pH Scale). Ammonia is more toxic at higher alkaline levels and higher water temperatures. The good news here is for Crystal Shrimp "farmers" as they often should keep their shrimp at levels that are acidic (Meaning below 7.0 on the pH scale). Ammonia in acidic water is less toxic to shrimp and this is why often times crystal shrimp farmers need not worry as much regarding ammonia in their tanks. What you should take away from this article is knowing that it is very important to monitor your aquarium with regular ammonia testing to ensure your tank is safe for all its shrimp and fellow tank mates alike. When testing you should have levels next to zero or as close to it as possible. A well-established tank that has been cycled and up and running for a while should be breaking down ammonia efficiently. 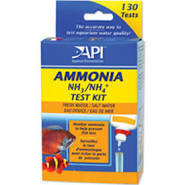 When testing our aquariums I personally use API test kits as I find them to be the best option out there. Test Tube API kits are the best and most accurate I have found in the hobby for the price.